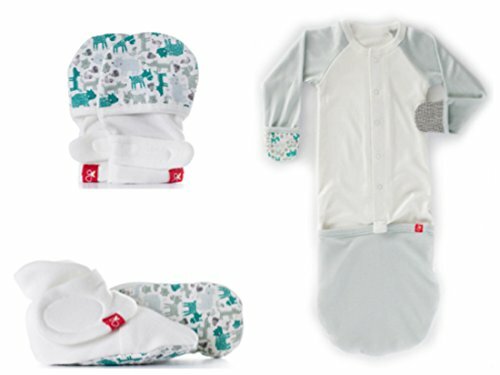 Goumi Newborn Bundle comes complete with one pair of goumimitts, one pair of goumiboots, and one goumijamms. Our newborn set mitts and boots come in size 0-3 months (6-15lbs/ 2.5-7kgs) and our jamms in Newborn size (for babies 5-7lbs / 2-3kgs). Our innovative, stay-on baby mittens give babies comfortable scratch and germ protection. All pattern choices promote infant brain and eye development, with high-contrast, bold, reversible patterns. Our baby mittens and booties were designed to actually stay put with our signature two-part closure system that remains secure and allows for adjustable fit as your baby grows. Goumijamms are the only sleepwear that includes non-scratching mitts, an extra-large neck opening, and convertible bottom that makes diaper changing a breeze. Goumijamms by Goumikids are soft, scratch-free, sustainable and smartly designed without the use of zippers to keep your baby safe and cozy. Our stay-on baby pajamas can handle all baby wiggles and wriggles, with integrated Goumimitts and bottom foot pocket for scratch and germ protection. Flip over the mitts to keep little hands warm and scratch free. Made of a sustainable, machine-washable blend of 70% bamboo-derived viscose and 30% organic cotton blend, all Goumi products are gentle on baby’s skin and kind to our planet. This breathable material is naturally antimicrobial and environmentally sustainable that keeps you cool in the summer yet warm in the winter. All of our products come pre-washed but when it’s time to wash we recommend machine-wash delicate with cold or warm water and hang dry.